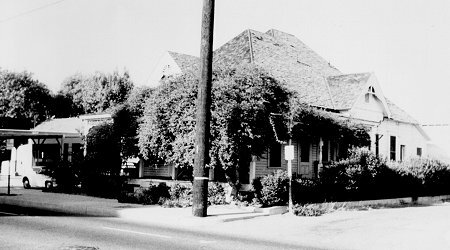 The Clark House is a unique example of the Eastlake style in Fullerton. 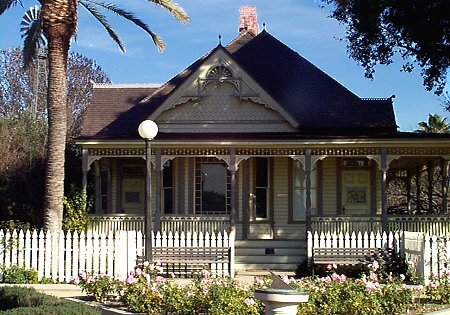 Moved to the Fullerton Arboretum from its original location at 114 North Lemon Street in 1972, the house was subsequently restored over a number of years and has been given the name Heritage House. The original gabled roof had to be removed for the move; a new roof as well as a double chimney was reconstructed, identical to the original. The interior has been fully restored and refurbished with furniture and medical equipment of the era. A new ramp for handicap accessibility was constructed on the backside. The Clark House is one of the oldest surviving homes constructed within the city's original townsite. This exquisite home provides a valuable memory of the appearance of a prominent residence in Fullerton around the turn of the century. The treatment of the exterior, the apparent exposure of construction details, the use of beveled and stained glass windows and the balanced format are indicative of the Eastlake style. The setting within the Arboretum has been designed to reproduce an authentic environment for the Clark home - like one that might have been seen in agrarian Fullerton in 1894. Dr. Clark was one of the most highly regarded individuals in early Fullerton. His house and office was a center for the medical, cultural, and civic activities of the community. He was active in a host of civic and social activities as well as a leader in the local medical profession. Dr Clark had an active role with the city's incorporation and was elected to serve on the first city council in 1904. He was instrumental in having the Fullerton General Hospital constructed in 1913, at the northeast corner of Amerige and Pomona Avenues. His professional life reflects the growth of the region: it is estimated that during his career he brought into the world over 2,500 Orange Countians. His dedication to his profession is borne by the fact that he did not retire until he was nearly 80 years of age. The house on Lemon Street served as his residence and office for fifty-five of those years.